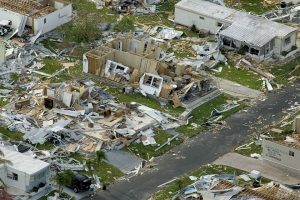 Hitting Florida’s coast on Oct. 10, Hurricane Michael was one of the strongest and most devastating storms in the history of the United States. In terms of sustained wind speed, it was the strongest storm to hit the United States since Hurricane Andrew in the early 1990s. In terms of atmospheric pressure, it was the third strongest storm the country has experienced. Because of its massive size and power, Hurricane Michael left a trail of destruction in its wake. However, the U.S. National Guard, along with other branches of the military, were standing by to provide relief efforts. Prior to Hurricane Michael making landfall, the governors of Florida, Georgia and North Carolina declared a state of emergency in their respective states. Florida, which was hit the hardest, had more than 1,100 National Guard members on duty. In addition to this personnel, Florida’s National Guard also had about 670 boats, and water vehicles as well as helicopters ready for post-Michael relief efforts. The National Guard utilized these resources to perform search and rescue operations as well as food, water and medical services to those affected by Hurricane Michael. O course, Florida wasn’t the only state to be hit by Hurricane Michael. Hundreds of homes and buildings in Virginia were also destroyed by the massive Category 4 hurricane. Thankfully, though, the U.S. National Guard was also standing by to provide relief efforts here as well. In Danville, Virginia, for example, a team of National Guard soldiers provided water transport for those affected by the storm. The team used boats and rafts to rescue stranded citizens. The National Guard also used helicopters to conduct search and rescue missions where water transport wasn’t feasible. “During domestic operations, the Virginia National Guard receives missions through the Virginia Department of Emergency Management and responds as part of the state’s multi-agency team,” explained Brig. Gen. James W. Ring, Virginia National Guard Director of the Joint Staff. “Our personnel in the Danville area coordinate with local emergency management officials to provide additional capabilities to assist with the response and help people in need,” wrote the National Guard on its official website. Some people assume that the U.S. National Guard is a simply a backup auxiliary of the military that performs combat support, but this couldn’t be further from the truth. For decades, the National Guard has been essential to disaster relief efforts. This became apparent in 2005, when the National Guard led relief efforts following Hurricane Katrina. Since then, the National Guard has been called on to help with countless other disaster relief efforts, including Hurricane Michael.